BB Crafts offers you distinguish varieties of colors and shades in crinkle organza overlays, which used to add a contemporary touch to your home decoration as well as clothing with a fantastic range of stunning colors and shades. You know the creases present on the overlays naturally decorate the organza to make decorations more impulsive. Beautiful quality of organza fabrics with crinkles helps you to achieve elegance in a new way. You can also use in any gift wrapping or table decor overlays. 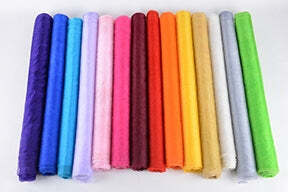 There are different shades available in this particular fabric that gives you a very trendy and contemporary look. Make sure that you search all the options available AT our online store.